You’ve taken the right step by clicking on this article! Learning about beagle training is one of the most important things you will ever do for your dog. The firstly and most important thing to establish with your beagle is your alpha leader position. This will show your beagle that you are the leader of your household or pack. By doing this it you will create structure for your beagle. They will also see you as their protector and will begin to trust, respect and listen to you. All these things will make your beagle training a lot easier. If you don’t establish this alpha leader position, then your beagle will be harder to control and train. They may also become aggressive or anxious. Do not give your beagle attention for the first five to fifteen minutes after you arrive home. It make be hard, but you need to do this to establish your alpha leader position. In the wild, the leader of a dog pack always eats first. So to establish this natural behaviour it is important to always eat before your beagle. This will show your beagle that you are the alpha leader and they will learn to respect you. Once you’ve established your alpha leader position in your household you can then continue with your beagle training. It is important to start beagle training from when they are a puppy. Beagles will take more aboard when they are eight to fourteen weeks old. You can still train your beagle when they are older but it will become more difficult. So try and start beagle training early. If your beagle does something wrong and you get frustrated it is important to not get angry or yell at your beagle. If you show anger or violence your beagle will just get scared and it won’t help their behavior. Instead be assertive but not scary. This will help your beagle stay calm. A calm beagle is much easier to train than one who is frightened. It is important to be consistent when beagle training. For example never put your beagle on your bed if they aren’t allowed there normally. You need to do the same for all other aspects of you and your beagle’s lives. Another example is to never feed your dog from your plate if it is something they are not normally allowed to do. Consistency is so important! By being consistent it will allow your beagle have structure. And by having structure they will learn at a much faster rate. It is so important to spend time with your beagle and to socialize them around other dogs, children and adults between the ages of eight and fourteen weeks. Take your beagle for walks and to dog parks. If you don’t socialize your beagle at this crucial age your beagle may become aggressive or even anxious. So start socializing your puppy from eight weeks of age to avoid this serious problem. Before you can teach your beagle difficult commands you need to begin with the basic, simpler commands like ‘sit’, ‘stay’ ‘down’ and ‘come’. Beagles are smart but remember they will not learn things straight away. You need to repeat commands over and over again until it sticks to their memory. Use rewards also, such as treats or affection. So take time every day for beagle training and reward your beagle for their good behavior! Beagle training can be fun! Establish your alpha position first and start training early. Soon you will have a well-trained and happy beagle. 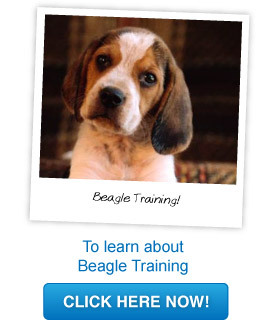 Start you beagle training today!